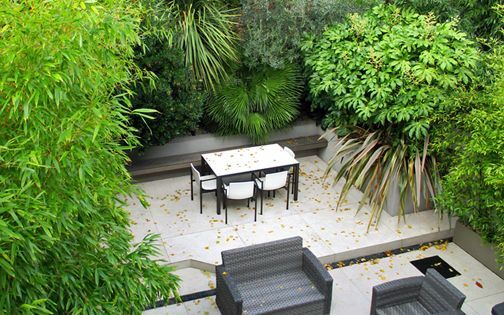 Countless of our London garden design projects focus on the creation of innovative small town courtyard gardens, where private landscapes in a multitude of scales portray diverse, highly refined and secluded outdoor havens. 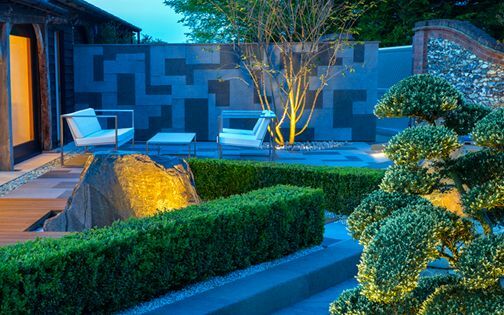 Predominantly personal and passionately detailed, these walled gardens mitigate an overly streamlined urban reality, where the intimate, offbeat, exotic and architectural aspects of our clients' homes find their natty niche in unique courtyard designs. 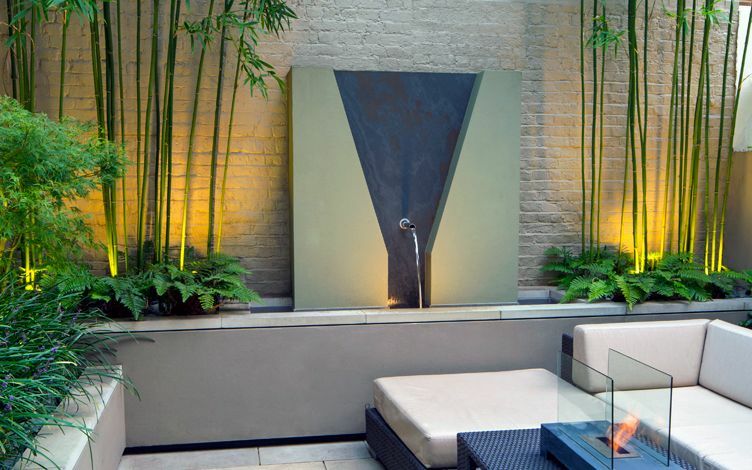 Our distinctive approach, in-house landscaping team and sculptural planting style, delineated through meticulous proportion, balanced colour palettes and bold textures, evoke and aptly sustain courtyard essentiality through astute juxtaposition of sculpture, water, foliage, hardscaping and lighting elements – the very rudiments of classic courtyard gardens, reimagined in contemporary London settings. Location: London SW18. Size: 25sqm. Courtyard: elongated corner plot with roof terrace. 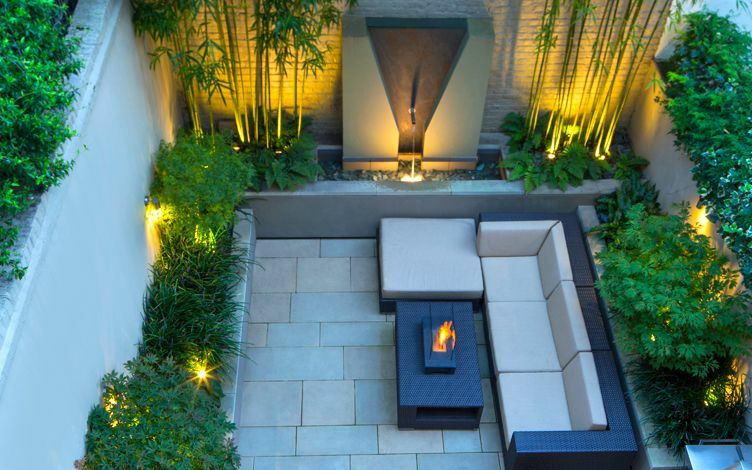 Design elements: sculpture display wall, hardwood decking, buff sandstone, custom planters. 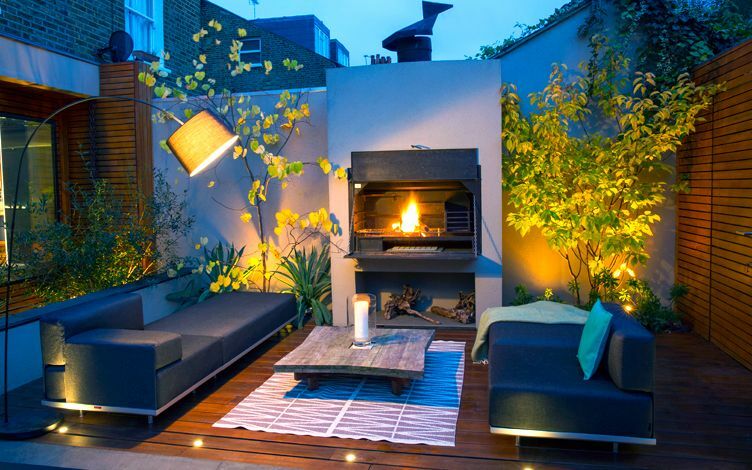 Landscaping: outdoor wine pantry, fish pond, sgraffito lime render, fire features, seating, heating. Location: London W1. Size: 40sqm. Courtyard: internal, flat, shaded squared space. 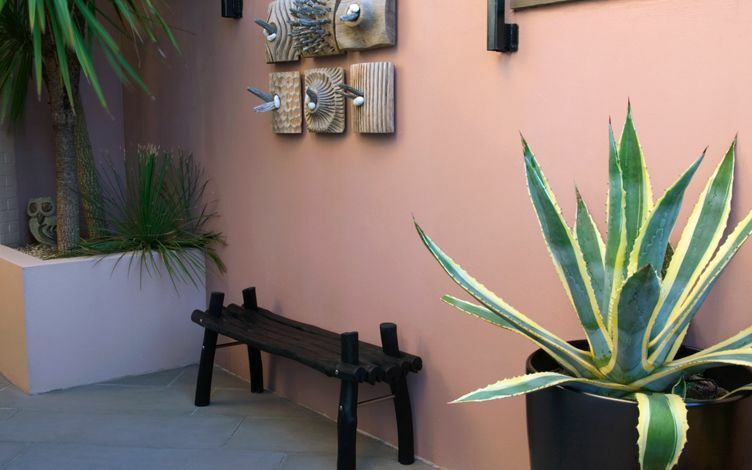 Design elements: sculptural hedging and topiary, architectural Wheel trees, bespoke troughs, green wall, play area. 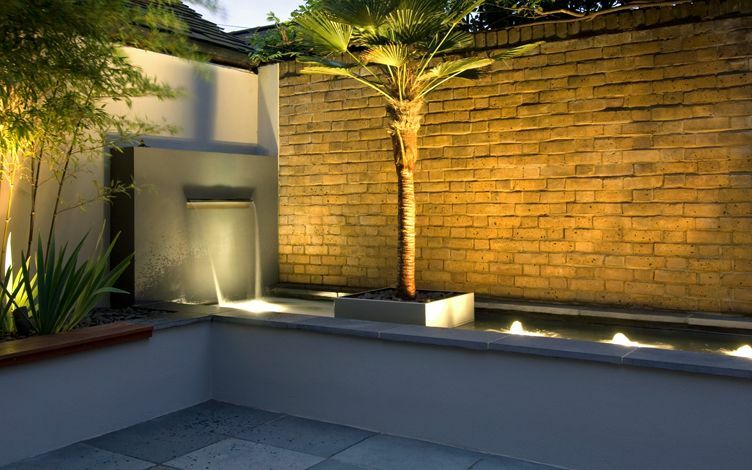 Landscaping: artificial grass, porcelain tiled patio, Cedar screen, shade planting, irrigation, heating, remote-controlled lighting. 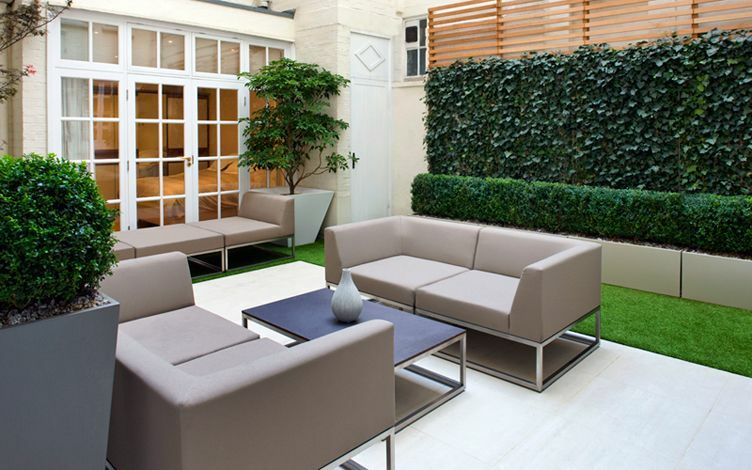 Location: London SW1. Size: 30sqm. Courtyard: small, subterranean outside space with high walls. 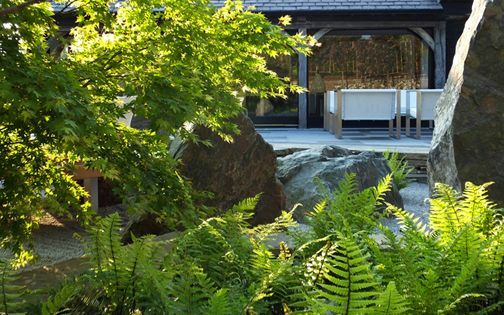 Design elements: central, large-scale slate waterfall, Japanese woodland flora. 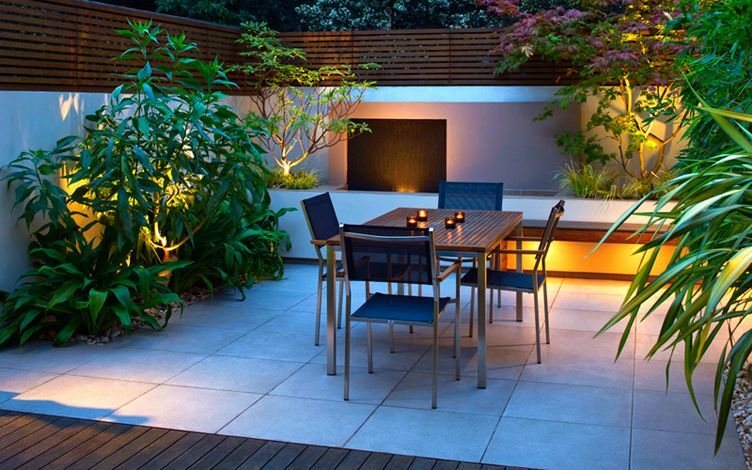 Landscaping: Yorkstone paved patio, floating raised beds and recessed coping, fire feature. Location: London SW4. Size: 50sqm. Courtyard: square, walled garden outside a modern house extension. 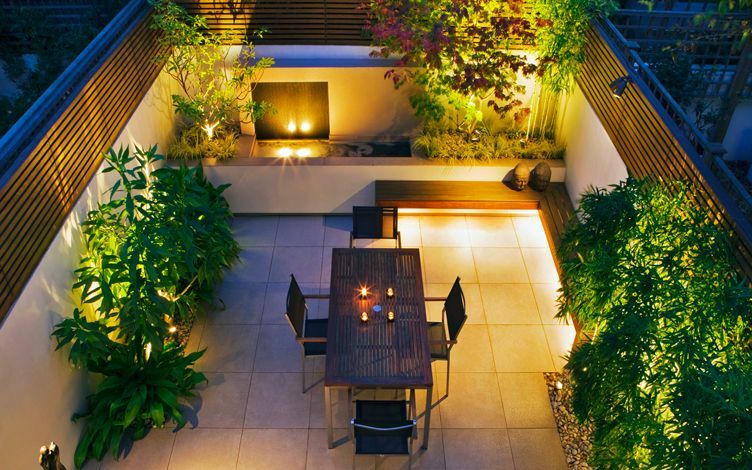 Design elements: outdoor oven and fireplace, bar, storage, subtropical planting scheme, sculpture wall, waterfall. 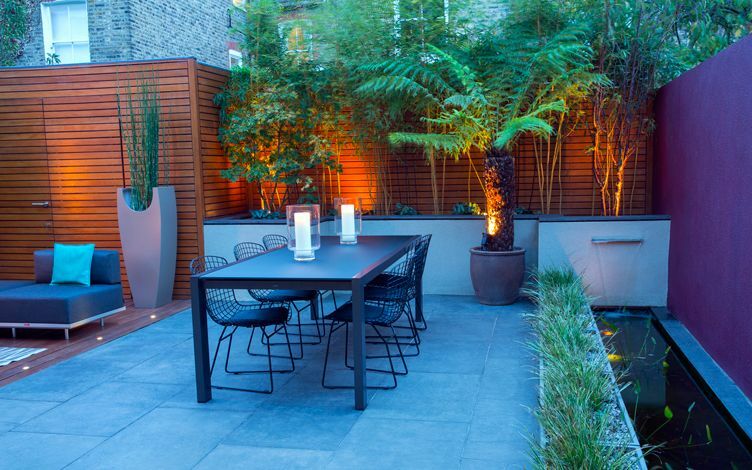 Landscaping: raised beds, bespoke powder-coated signature planters and vases, Ipe hardwood decking, basalt paving. Location: Essex CB11. Size: 220sqm. Courtyard: west-facing, large-scale, walled garden. 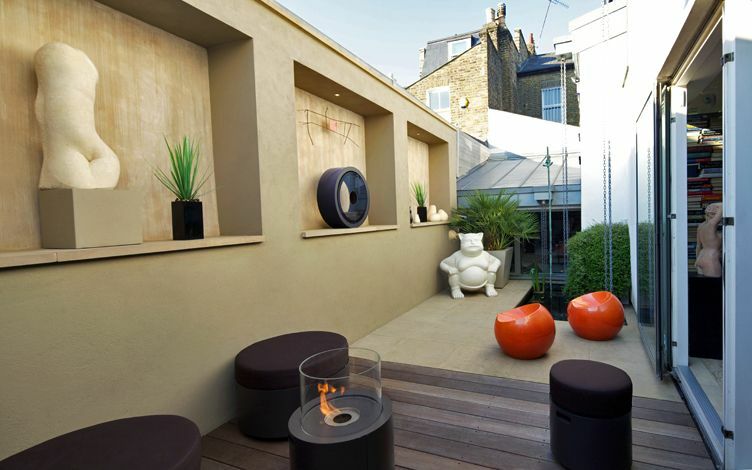 Design elements: modern Japanese garden, floating daybeds, sun lounge, water feature. 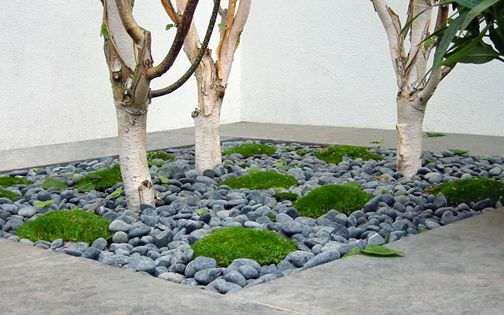 Landscaping: granite rocks and paving, basalt steps, sunken garden, hedging, irrigation, lighting. Location: London NW3. Size: 40sqm. Courtyard: rectangular end plot. 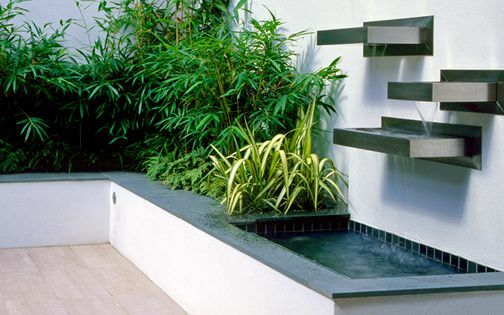 Design elements: waterfall pool with fountains and a floating Palm tree, exotic planting scheme, built-in seating. 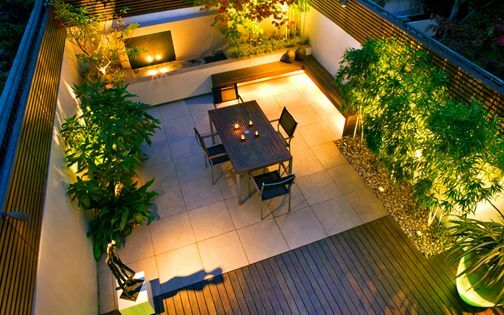 Landscaping: Ipe deck, limestone patio, raised beds, irrigation, lighting, outdoor furniture. Location: Dorset BH13. Size: 65sqm. Courtyard: south-facing, triangular corner plot, old walls, sunny coastal setting. 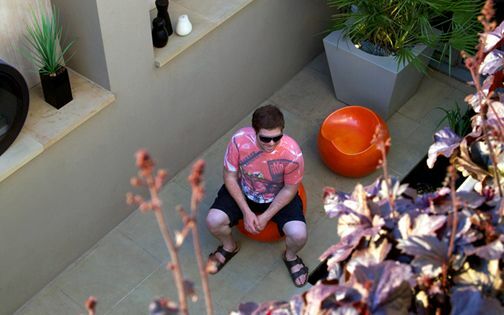 Design elements: outdoor sculpture gallery, architectural succulents, natural stone in minimalist detailing. 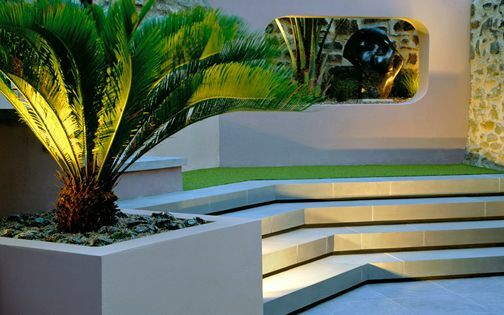 Landscaping: multilevel stairways, raised beds, floating steps, specimen Palm trees, colour scheme, irrigation, lighting. 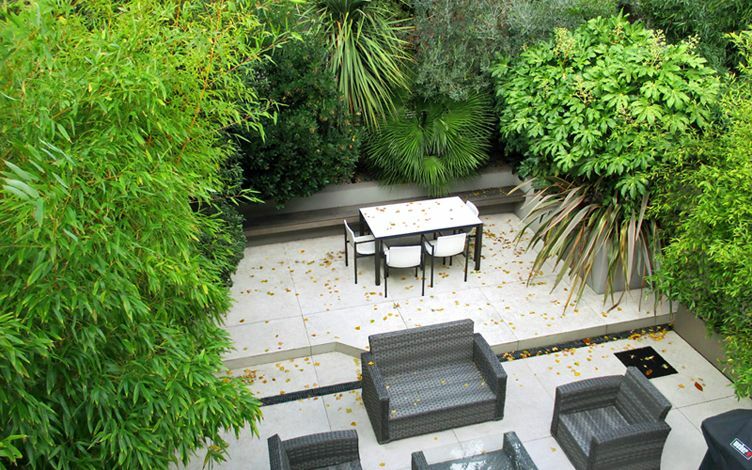 Location: London SW6. Size: 36sqm. 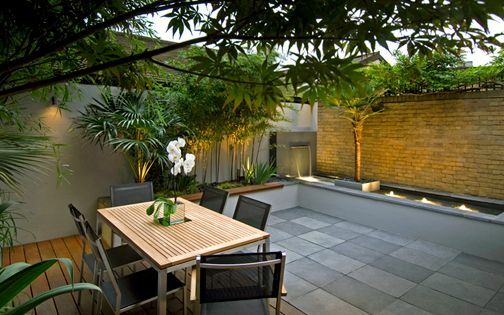 Courtyard: urban setting outside a contemporary home extension. 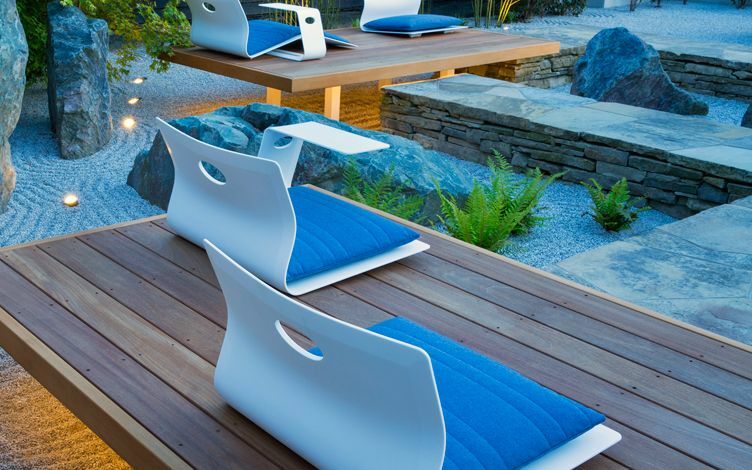 Design elements: granite waterfall and pool focal point, Cedar privacy screens, custom-built bench seating. 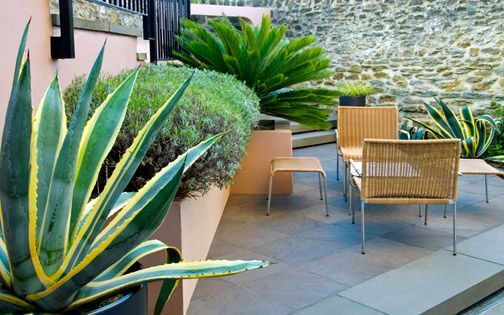 Landscaping: Balau hardwood decking, porcelain tiles, architectural planting, sculpture, automatic irrigation, outdoor heaters, lighting. 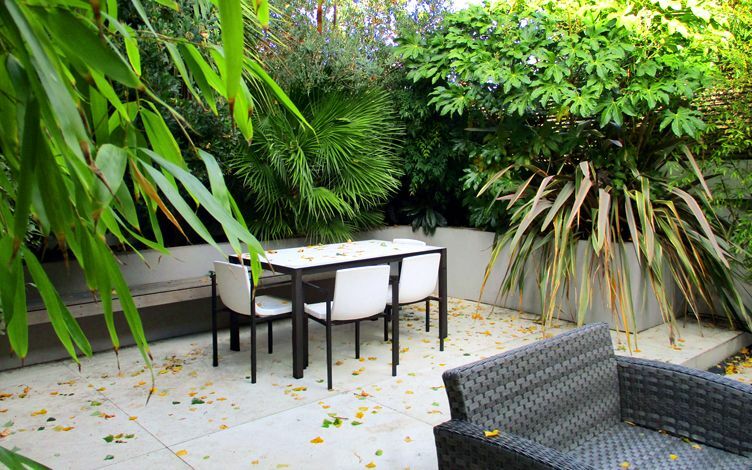 Location: London SW6. Size: 24sqm. Courtyard: walled urban space outside a modern extension, adjacent to a park. 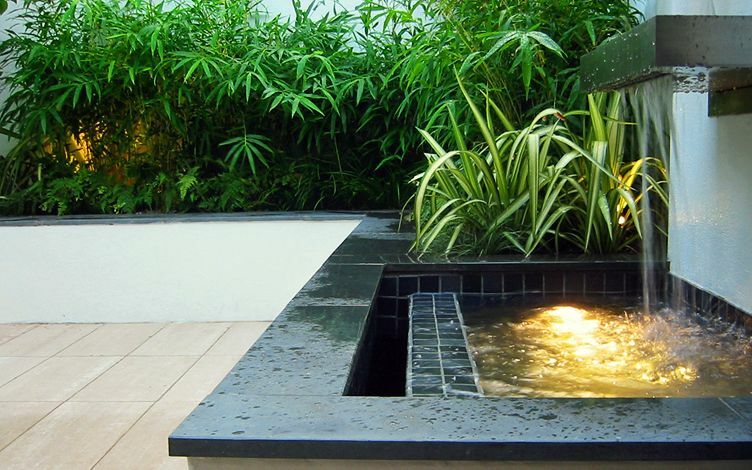 Design elements: multi-tiered stainless steel cascading waterfall with tiled pool, lush subtropical planting. 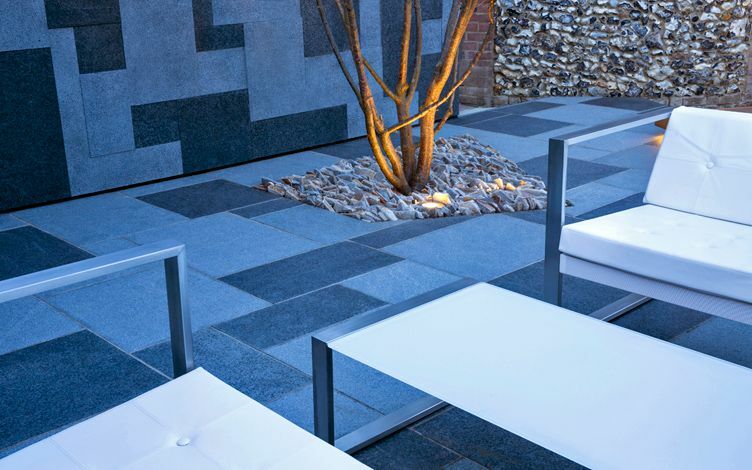 Landscaping: porcelain tiled patio, L-shaped raised bed with integral seating and a slate coping detail, recessed light fittings and bespoke tapered vases, Himalayan silver birches. Location: London N1. Size: 50sqm. Courtyard: south-facing, square garden. 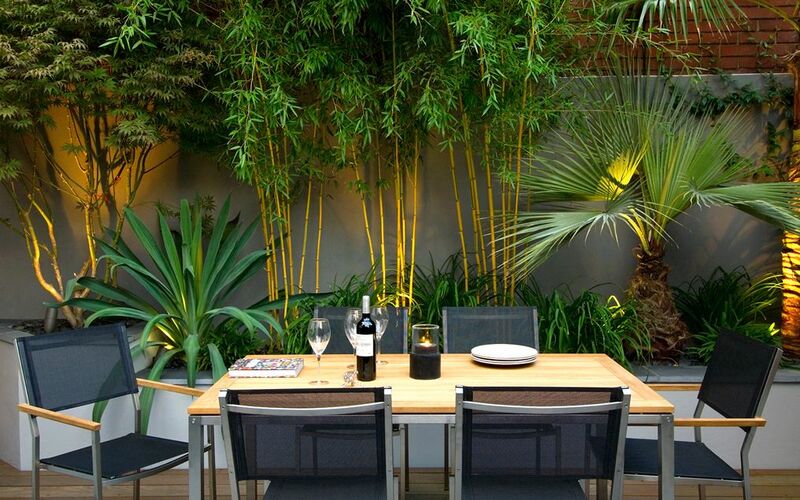 Design elements: Mediterranean planting, colour scheme, topiary, Blanc de Bierges paving and table, sculpture. 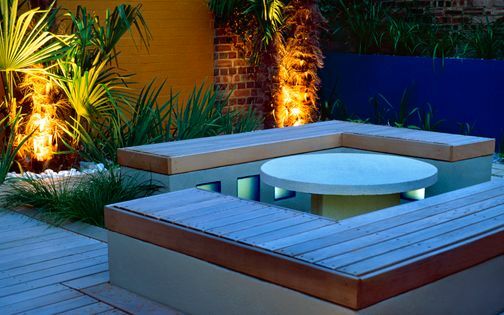 Landscaping: Cedar decking, custom-built benches with blue glass blocks and storage, architectural raised beds, Palm trees, outdoor lighting. Location: London NW6. Size: 100sqm. Courtyard: north-facing, walled back garden adjoining a modernised townhouse extension with a roof terrace and front garden. Design elements: New Zealand and Japanese shade floras, seating, cooking and dining areas, split-levels, natural colours. 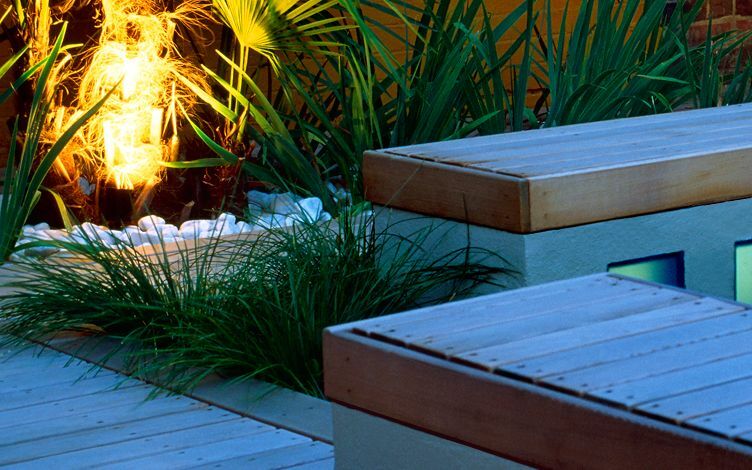 Landscaping: Cedar wood privacy panels, custom planters, cantilevered bench, raised beds, large tiles, lighting, irrigation.